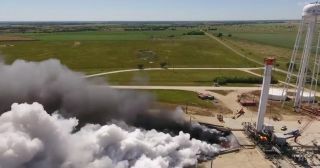 SpaceX performed the first static-fire test of a Falcon Heavy rocket core at the company's Texas test facility in early May 2017. SpaceX just notched a big milestone in the development of the company's powerful new Falcon Heavy rocket, which is scheduled to fly for the first time a few months from now. "First static-fire test of a Falcon Heavy center core completed at our McGregor, TX rocket-development facility last week," SpaceX representatives wrote on Twitter today (May 9), as an accompaniment to an 18-second video of the rocket test. The Falcon Heavy is based on SpaceX's Falcon 9 rocket, which has been launching payloads to space since 2010. The heavy lifter's first stage consists of two Falcon 9 first stages strapped to a center core, which itself is a modified Falcon 9 first stage. Falcon 9 first stages are powered by nine Merlin engines, so 27 Merlins will get the Falcon Heavy off the ground. The heavy lifter's second stage harbors a single Merlin, just like a Falcon 9 second stage. Integrating these parts into a single rocket sounds simple, but it turned out to be "shockingly difficult," SpaceX founder and CEO Elon Musk told reporters on March 30. He was speaking during a teleconference after the company's successful launch of the SES-10 communications satellite. But now, after years of work, the Falcon Heavy is nearly ready to fly. "Our expectation is probably a late-summer launch of Falcon Heavy," Musk said during the March 30 telecon. That maiden flight probably won't carry anything too valuable, because the launch will be pretty risky, Musk added. Like the Falcon 9, the Falcon Heavy will be a reusable vehicle; SpaceX has said it aims to land all three first-stage "cores" after each mission and re-fly them. The company may also try to recover Falcon 9 and Falcon Heavy second stages eventually, Musk has said. The Falcon Heavy's first flight will feature two "flight-proven" Falcon 9 first stages, Musk added during the March 30 telecon. To date, SpaceX has successfully landed such boosters 10 times and re-flown one of them. This latter milestone occurred during the SES-10 launch.